Summary: Day 2 of starting out in my driveway and waiting for storms to fire. 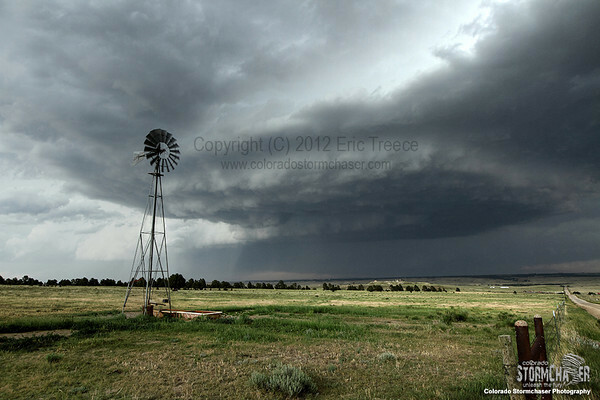 We headed out towards a growing cell west of Deer Trail and met up with Travis and Allison Speakman. The storm had some great structure and was heading in a SSE direction. As we headed up to intercept it north of Kiowa it went TOR warned. We intercepted the storm on a back road in the middle of nowhere. The storm rapidly developed into a monster storm. As we tried to get close to the core baseball hail began falling forcing us to retreat back to the west a little bit. As the storm continued to grow the hail core reached us again, although not nearly as big as it was……perhaps golf ball size. The winds really began to wrap hard around the meso and rain began to obstruct our view of the lower levels of the mesocylone, but there was a very prominant RFD notch visible to our immediate east. We had to double back to the west in some crazy outflow winds that were kicking up dust so bad that you could not even see the road. It was during this time we got separated from Travis and Allison and we got to Hwy 86 and headed east for a mile or two and then blasted south to try and get back ahead of it so we could get back into a more favorable position. Near the town of Calhan we got out far enough ahead of it we sat up shop near the airport and shot some time lapse video of a gorgeous sculpted supercell. A few chasers closer to the core of the storm viewed an anti-cyclonic tornado. We saw several lowerings as it approached but we did not see the tornado. Pictures seen later that night had me scratching my head wondering what I would or should have done differently to get into position to see the tornado, but when you get such a beautiful storm with such awesome structure, you have to stop and take in the view while you can. So no regrets on my end overall. We chased the storm to south of Truckton, CO. It was TOR warned nearly the entire time. Since it was dark and was producing lightning like mad, we opted to do some time exposures instead of trying to see tornadoes. All in all it was an AWESOME chase. Supercell west of Deer Trail.